Eat at Joe’s: A beautiful story of what happens when a band of misfits and atheists get their hands on the feast of St Joseph. It is a habit in some parts of the world, to celebrate the feast of Saint Joseph with an elaborate feast, some theatrics, and a lot of charity. Some dear friends of mine decided that last night would be a good night to throw our own feast with our friends from Burning Flipside. One doesn’t have to know the burner community very long before one realizes that there are a good portion of the community, thought not all of it, with total indifference or heated antipathy toward religion and specifically the Christian Church. Having heard some of their stories, I don’t blame them, not a bit. So while most people didn’t really even notice or care about the religious significance of the event, I did, and one more piece of this particular outpatient was welcomed home. Particularly in Italy St Joseph’s feast is no small event, not too unlike St. Patrick’s day. People dress in red, there is an actual feast, and the altar gets piled up with donations, especially food, for the poor. Its quite the event. One of the key elements is the reenactment of Mary and Joseph looking for boarding in Bethlehem. They knock on, and are rejected at the first door, again at the second, and finally they are welcomed at the third. At its core the feast of St Joseph is hospitality. It is about welcoming and reaching out to strangers or to those who have no safe place or not enough food. So Last night I brought my picture of St. Joseph that a “Catholic Worker” community gave me just after my dad, Joe, died. For me it was a way of bringing my faith, and even my Father’s memory into a community that may find those things strange or even unreasonable. But one of the things I really appreciate when I arrive at the greeter station at our local burn event, I am always greeted with hugs and a giant “welcome home” sign. Its a place where ugly ducklings go to find their swans and everyone gets to be part of the popular crowd. Its a potluck of creativity and therefore a perfect bunch of people for me to celebrate St Joe’s day with. After all these years we have spent together, we have become used to being strange in front of each other. So when I show up with a new level of strange, it may go mostly unnoticed, but I still know that I am made a little more present to the community, and to myself. I also think it creates an opportunity to think differently about other people who are a little bit more like me as well. Our space for others gets a little bigger. When we as people say, “welcome home,” we are not just welcoming a person. We are welcoming the very notion of “home” to come into being. We are conjuring up a place, a relationship, for people to be together in the possibility we will call out the best in each other. One of the best ways to find a home, is to welcome someone else. I am not saying that the burner community has become “the church” to me. They don’t want to be. I am not saying the Church is or should be like the Burner community. But here is a thing about potlucks and feasts: we bring whatever it is we have to bring, we put it on the table and we eat out of each other’s dishes. I am definitely saying friendships change things. You welcomed our feast of hospitality. And from our excess, others too will eat. I love you, sir. All your words are great, and this was excellent. I just realized my comment didn’t post! In fact, I don’t know where it went. “And from our excess, others too will eat.” Yep. Most of us have the ability to feed ourselves. More to feed at least a few others. Those who have even more, enough, you might say- can help us feed a lot of others. And the feast turned out SO much better than I imagined. Better than I’d hoped. Last year, it was kinda so-so. This year was a blast! Great food, decorations, tons of people, lots of donations etc. So exciting. 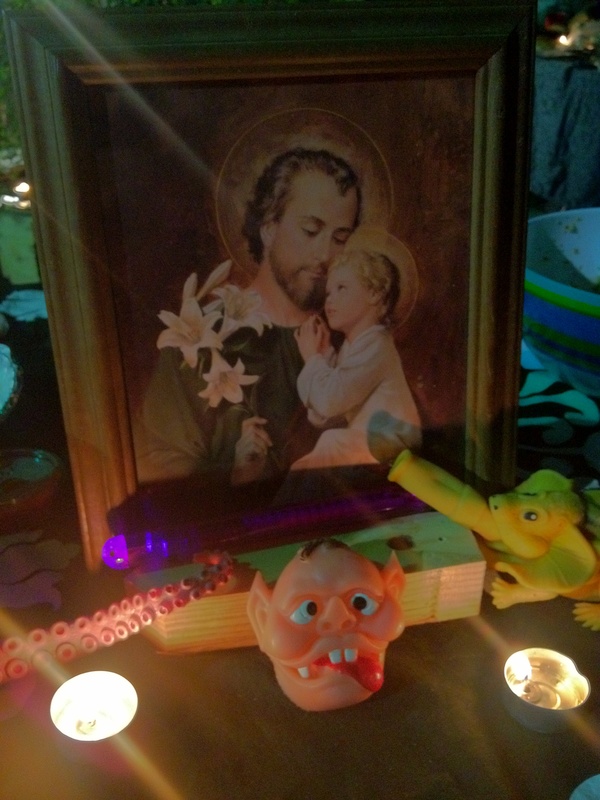 You bringing that picture of St Joseph really meant a lot to me. My printer was out of ink and I hadn’t the time or money to go pick up a statue. Also, that it was given to you after your father died made it more special. The idea and reality of fatherhood is so much closer to my heart now that I have a son. I get to watch Bob becoming Father. It’s a beautiful thing. I absolutely agree. These friendship help to end a little suffering in the world. I want to be part of that. I feel honored to have the friends I do.